I have had this photo for some time but knew nothing of the advertiser - Rowley. But the setting was so dramatic, I thought I would share it anyway. After all, we can let things speak for themselves on occasion, can't we? This illuminated billboard was located on the West Side Highway in Chelsea, a neighborhood in the West 20s, abutting the Hudson River and the highway. Chelsea has become somewhat of an art district, as there has been a migration of galleries from areas like SoHo due to extraordinarily high rents. 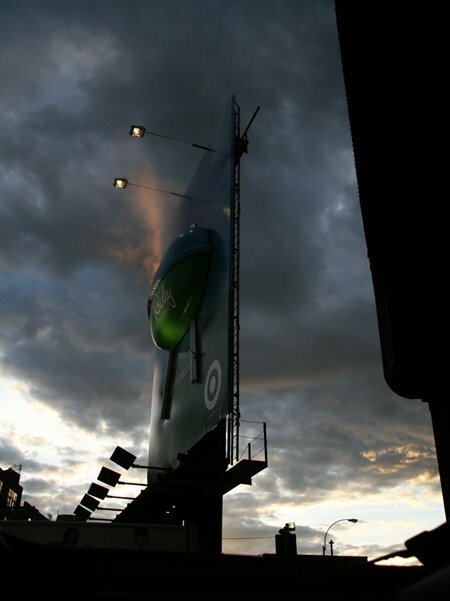 I am not a fan of billboards - I find that they are typically a blight on the landscape. But there can be beauty, particularly dramatic beauty, at times with industrial and commercial subjects. Smokestacks, oil refineries, bridges, power plants and power lines can all show a striking profile when the lighting conditions are right. I have written of this before in my posting Hell's Gate.